The school holidays are nearly upon us, and if you are looking for something fun to do, join us at the Penthouse Cinema in Brooklyn, and help support the Karori Toy Library. 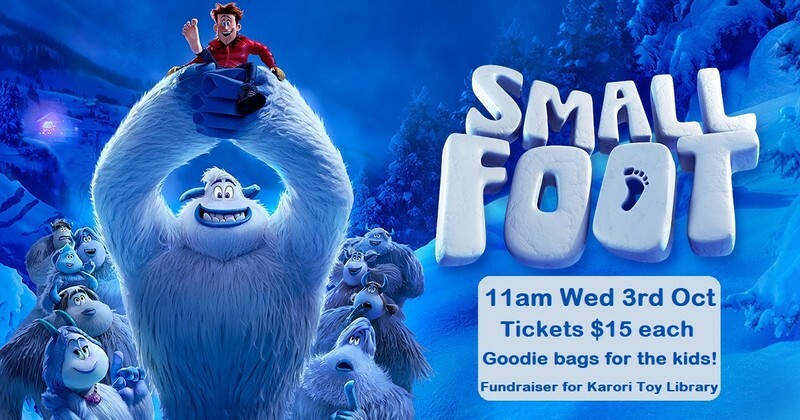 On Wednesday the 3rd of October, we will be screening the movie "SmallFoot" at the Penthouse Cinema in Brooklyn, at 11am. The movie is being released in New Zealand at the end of September, so join us and be one of the first to view it! Tickets are $15 each for children and adult alike - the kids will receive a fun goodie bag, and there will be some great spot prizes up for grabs! To secure your spot, pop in to the Karori Toy Library (details below) or email karoritoylibraryfundraising@gmail.com with the number of tickets you require, we'll send you our bank account details and once the payment has gone through, we'll post the tickets out to you (or you can collect them at the theatre on the day) - Easy Peasy! All money raised from the fundraiser will go towards purchasing new toys or replacing/repairing old toys. Please forward this to any one you know that might be interested, or looking for something to do with their kids during the holidays! "An animated adventure for all ages, with original music and an all-star cast, Smallfoot turns the Bigfoot legend upside down when a bright young Yeti finds something he thought didn't exist - a human. News of this Smallfoot throws the simple Yeti community into an uproar over what else might be out there in the big world beyond their snowy village, in an all new story about friendship, courage and the joy of discovery". (*Please note we will not be open on Tuesday the 2nd of October, during the school holidays).